Control room has suspected that your army base has been attacked by hoards of air stealth jet fighter planes, unknown ship carrier and bombarding panzer tanks .Itâ€™s an assault attack by the enemy force and you fleet has been destroyed and you have left alone against this brutal force. 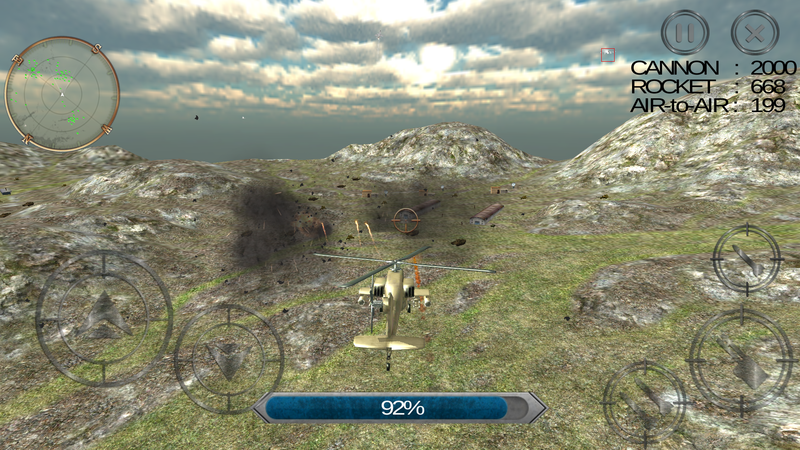 The only choice left for you is to combat your enemy with missiles utilize your Apache canon armory and bombs against these enemy jet fighter planes and save your base at island in deep sea. Don,t let any of the enemyâ€™s fighter planes in your base and strike back with your ammo. Get on to the seat of cockpit take control as a Sole fighter, pass through all the waves and prove your dominance over the combat enemy force. You have to complete the mission in two challenging levels in different areas of sea and mountain. Features: There are two intense combating challenging combat battle levels. Sea and mountains. Apache combat health bar. Stunning visual graphics. Targeted missile system to destroy supersonic jets and Apache gunship helicopter.